John Bullin Master sinker is shown in the photo. In July 1967, Bestwood colliery (South Nottinghamshire) sunk in 1872-1878 by the Bestwood Coal and Iron Co Ltd, John Bullin was the Master Sinker, i.e. in charge of all sinking operations on all shifts. The Pit was closed after 95 years and merged with Linby. Bestwood was situated to the south east of Hucknall Torkard. Shaft positions: SK54NE, No1 455598, 347496, No2 455612, 347452. The shafts were 60 yards (55m) apart and both 13’ 2” (4.01m) dia with 60 yards (55m) of tubbing and sunk 364 yards (333m) to Top Hard. Surface level of the pit top was 223 feet (68m) above sea level. 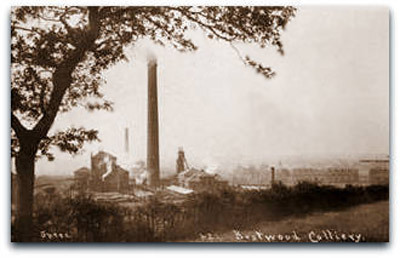 Between 1911 and 1917, subsidiaries of Bestwood Co Ltd were Askern Coal and Iron Co Ltd and Foraky Boring Co (later housing the emergency borehole equipment). The basal breccia cutting off the water-bearing measures and the top of the coal measures was at 216 feet (66m). Top Hard 6’ 8” (2.03m) at 1241 feet (378.3m). In 1931 3,000 v 3 phase transformer introduced underground. Pithead baths were opened in 1933. A surface drift called the Lancaster drift after J Lancaster the first Director was driven in 1949-1950 and operational by 1951, mouth entrance 43/5547/539546, 220 feet (67m above sea level). A cable belt was installed in 1955. A Kue Ken crusher was installed in 1957 and a new tub circuit and tippler on the pit bank. Loco workshop was built in 1958. Two 4 wheel diesels 1961. Two 23hp 0-6-0 diesels 1953 and 1954. Seven of these were transferred to Linby 1968/69. Main Bright 2’ 10” (0.86m) start 1915/1916- 23rd Nov 1918, resumed single face Dec 1928-16th July 1937, reopened again 1956-12th May 1967. Lancaster drift extended to Main Bright in 1959. Koepe system of winding was employed at the shafts raising 4 tubs of 11 cwts (in 1894). Headgears wrought iron lattice, 70ft (21m) high. No1 UC engine 2 vertical cylinders 36” x 72” (0.91m x 1.82m), one plain 19 feet (5.8m) dia drum wood lagged and grooved accurately to fit a rope to 18 feet (5.5m) dia pulley wheels. No2 DC shaft engine, 2 horizontal cylinders 30” x 60” (0.76m x 1.52m) fitted with side valves. Drawing ropes 4½” (0.11m) in circumference and balance ropes. At the coal prep plant there were screens to separate house coal from steam and cannel. The chimney was 210 feet (64m) high and 8’ 6” (2.6m) dia. There were 12 Galloway boilers. The ventilation was created by a Guibal fan 46 feet (14.0m) dia x 15 feet (4.57m) wide, 36 revs per min giving 135,000 cu ft per min at 2” (0.05m) water gauge (in 1894). In 1928 there was a reorganisation of the pit. Mechanisation was introduced underground and including in the surface alterations a new coal prep plant was built. Longwall method of working cutters and conveyors introduced by 1932 and by 1936 the pit was 100% mechanised. In 1943 a retractable landing platform was installed at the High Main horizon requiring a clutch for the winding gear to be fitted. Marsaut safety lamps were used for illumination until replaced with the modern battery and cap lamp in the late 1940s. In 1946 further development of the High Main continued and working was done by the bord and pillar system. A new satellite shaft 18’ 2” (5.54m) dia to allow workmen to access the Top Hard workings from Bestwood and also act as an airshaft was sunk at Calverton 1946-1950 and a wide coal heading driven to connect the two. However the idea didn’t last too long before the Top Hard workings in that area were abandoned. After the Second World War a second shaft would be sunk at Calverton and the pit then became a unit in its own right. A cable belt was installed in the High Main seam in 1955. 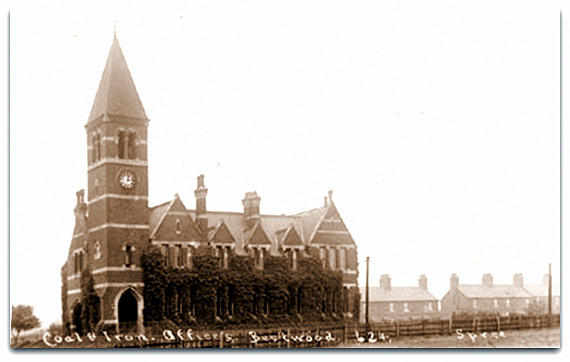 Bestwood Mission Church, central workshops and stores and Medical centre for the Area were situated on the site. 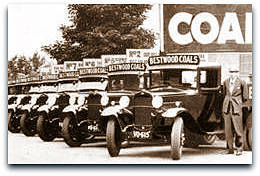 A fleet of lorries, as shown, delivered the excellent quality coal to many parts of Nottinghamshire. Rows of terraced housing lead to the pit yard entrance. On the Top Hard abandonment plan a note states that the workings were plotted by magnetic to 1936 (magnetic correlation 9/6/1922) and then on an arbitrary grid to 1948. There could be a probable error of 20 yards (18.3m) to the extremities of the workings! Maximum manpower in 1948 was 2,294 when 825,853 tons was turned. First one million tons produced in 1952, with 1,047,831. Maximum output 1,127,424 tons in 1955. The offices adjacent to the colliery were maintained and continued as South Nottinghamshire Area HQ. Additional prefabricated office blocks were built to house the Area staff. Anderton shearer with Dobson chocks was installed in the High Main seam in 1956. A Joy shovel loader was introduced in 1956. A new stores building was opened in 1959. Central Stores for the Area were opened in 1962. There was a connection to Linby at High Main level. Wire meshing was tried successfully behind the arches as side support in 1962. Lord Robens Chairman of NCB visited the colliery and offices in 1962 accompanied by CG Lancaster MP. A bakery for NCB in January 1953, was in the extension to the pit canteen to supply bread and pies to 11,000 miners. The bakery was started about 10 years ago under BA Collieries.